Ned Jor­dan spent July 4th, 1923 at his Rhode Island sum­mer home, watch­ing his daugh­ter Jane per­form tricks on a salty pony: “That child could ride—well enough to win prizes at rodeos…. 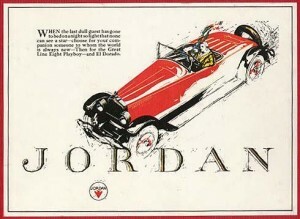 The Jor­dan Motor Car Com­pa­ny began with­out a fac­to­ry. In Detroit, chief engi­neer Rus­sell Begg devel­oped a body to wrap around a six-cylin­der Con­ti­nen­tal engine. 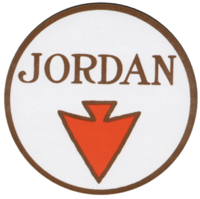 Final­ly Ned paid $50,000 for a five-acre site in Cleve­land, and by ear­ly July 1915 Jor­dans were com­ing off the line. Edward S. Jor­dan was born in 1882, the only boy in a fam­i­ly of six, in the lum­ber town of Mer­rill, Wis­con­sin: talk­a­tive, brash, a lit­tle bit rude, with heaps of deter­mi­na­tion but lit­tle mon­ey. He wore white spats and bright ties and well-tai­lored suits, but he wasn’t a huck­ster. He had style, like the cars he built and the words he wrote.